Subway Squawkers - A Yankees-Mets Rivalry Blog: Here's the world's smallest violin, Randy Levine, playing just for you! Here's the world's smallest violin, Randy Levine, playing just for you! The world's smallest violin. Playing just for Randy Levine! Leave it to New York Yankees president Randy Levine to make the team's point on revenue sharing so poorly, that you have no sympathy for what could be a potentially be a valid point of view. Why this clown, who, to steal a line from "The Hunger Games," is about as charming as a dead slug, is the "face" of the Yankees front office is beyond me. 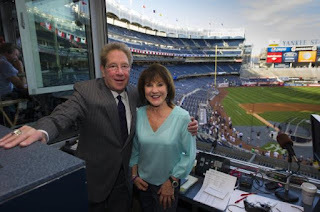 "What is very burdensome to us -- and is unfair -- is the amount of money we have to pay in revenue sharing compared, for example, to teams in our market that pay 10 times less than us,” Yankees president Randy Levine told FOX Sports. "Hopefully that is something that will get looked at in the next labor agreement." According to Levine, the Yanks paid $90 million in revenue sharing for last year. The figure is based on each team's net local revenue, and the Mets' figure is supposed to go up next year, commensurate with their increase in attendance. The Yanks also paid $26 million in luxury tax. Levine’s comment on revenue sharing followed his response to a question about the Yankees’ home attendance, which has declined every year since 2010 with the exception of ‘14. "The Yankee business is strong -- very, very strong," Levine said. "But we’re the Yankees. We can always do better. We always look to do better. Our attendance projections are up. All of our other revenue -- sponsorship, food and beverage – everything else is up. We expect to have a great team this year. I think it’s going to be a good year." Very strong? I dunno about that. Whatever happened to the idea that any year without a World Series title was a failure for the Yankees? It's now been seven years since the Yankees won a title -- their only title since 2000. Heck, it's seven years since they even got to a World Series. Meanwhile, the crosstown Mets, the team Levine is griping about above, won a pennant last year, despite spending over $100 million less on payroll. And the "we can always do better" line would have been a heck of a lot more appropriate 15 years ago, as opposed to now. Eight years in a row, the Yanks have spent over $200 million a year in payroll. In one of those years -- 2009 -- they won a World Series. In three of those years, they didn't make the playoffs at all. In the other four years, they had ignomious defeats in the postseason, like getting beaten by the Astros in last year's Wild Card game, and getting swept by the Tigers in the 2012 ALCS. Not only is that a terrible ROI (return on investment) for the money, but it means that there is a LOT of room for improvement. At any rate, you can't brag about how much money you're bringing in, and then complain about how much you're paying on revenue sharing. That does not compute. Also, on what planet are their attendance projects up? Is there, you know, actual hard evidence showing that? Here's the thing, though. Theoretically, there is a valid point here. As Rosenthal notes, "Another concern of high-revenue teams is that the money acts as a disincentive for low-revenue clubs to increase their own revenue -- in effect, becoming a permanent subsidy." But Randy Levine is the last person in the world who should be bringing up that point. Why he continues to be the voice of the Yankee brass is beyond me.